Asunción began the City Cancer Challenge process in May 2017, convening a multi-stakeholder City Executive Committee which brought together representatives from the public and private sectors throughout the city for the first time. The City Executive Committee undertook a needs assessment process with input from over 200 health professionals in 2017. The needs assessment identified a significant problem – the high fragmentation of the local health system, which had created a lack of inter-institutional coordination, inequality and a high cost of cancer care. The City Executive Committee proposed to review and analyse the current legal framework, prioritising the need to work collaboratively to draft a cancer law for Paraguay and address the significant issues. After an exhaustive review process between the City Executive Committee, City Cancer Challenge and various other stakeholders, the final Cancer Law was unanimously approved by the Senate in October 2018, with 50 million USD committed for implementation in Year 1, and a further 100 million USD under discussion for Year 2. The republic of Paraguay’s capital city, Asunción, is the most populated in the country, with 2.1 million people living in the metropolitan area – also known as Greater Asunción. Asunción is Paraguay’s industrial and cultural centre, and accounts for more than 30 per cent of the national population. According to latest estimates, Paraguay sees around 8,000 new cancer cases every year, and 5,000 cancer deaths. Prostate, lung and colorectal cancers account for the majority of cases in men, and breast, cervical and colorectal cancers in women. Cancer is the leading cause of death among the population aged under 70 in Paraguay. Although previous attempts have been made to introduce a draft law, this is the first time a cancer law has progressed so far in Paraguay. Members of the City Cancer Challenge Executive Committee of Asunción were instrumental in this process, collaborating closely to position cancer on the national political agenda, as well as reviewing and providing substantive comments on the draft text before it was presented to the Senate. In particular, the committee highlighted the critical importance of access to timely diagnosis, treatment and palliative care, aligned with City Cancer Challenge efforts. The proposed Cancer Law establishes the creation of a National Programme for Cancer Control (PRONAC) in Paraguay, providing a framework that emphasizes the right to access comprehensive services for cancer control as part of the right to health. The scope of the Law covers all services of Paraguay – public and private – dedicated to the prevention, early detection, diagnosis, treatment, rehabilitation and palliative care of cancer patients. Through adoption of the Law, the State will recognise and declare cancer as a disease that generates significant health expenses, and therefore requires special actions for the protection of the population. The Ministry of Public Health and Social Welfare (MSPBS) will be responsible for the design, planning, development, implementation, monitoring and evaluation of the National Programme for Cancer Control. 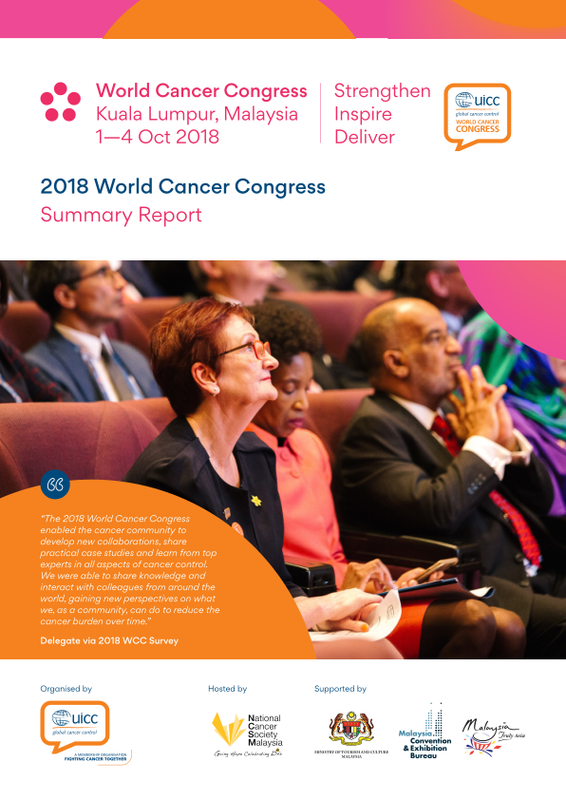 It will coordinate the implementation of the Law for the comprehensive care of people with cancer – including training, public health actions for prevention, research and evaluation for cost-effective health technologies, the organisation of entities and institutions, health services supporting cancer care, palliative care, oncological rehabilitation and other support strategies for patients, families and carers. The Law will also create an Obligatory Registry of Patients with Cancer dependent on MSPBS. All public and private institutions of the National Health System will obligatorily keep the records according to set guidelines. The Registry will work actively and permanently, guaranteeing the opportunity for uniformity, comprehensiveness and comparability of the data. In all cases, confidentiality and respect for the patient's rights will be guaranteed. By adopting the Law, the State will guarantee to all persons with cancer, the full protection of all the rights and guarantees outlined in the National Constitution for all the inhabitants of the Republic. The City Cancer Challenge City Executive Committee has continued to provide support and expert input as the draft Cancer Law is considered for adoption, including meeting with members of the Senate. The City Cancer Challenge needs assessment process has reinforced the belief of the City Executive Committee that a decrease in cancer mortality can only be accomplished through a deep understanding and closer look at the local health system, its characteristics and barriers. The process has also reinforced their belief that changes need to be implemented at different levels, with the commitment of multiple stakeholders from different sectors. 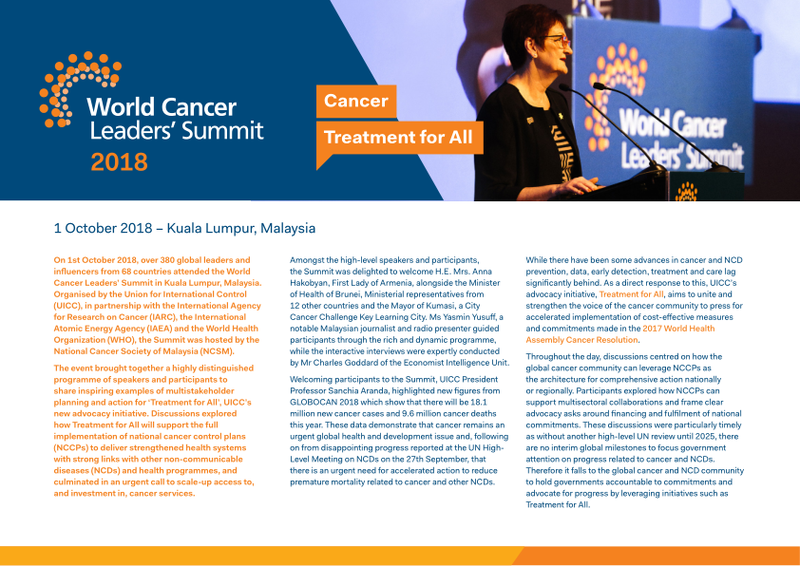 Passing of the Cancer Law and providing the financial support to implement sustainable cancer control solutions, identified by city stakeholders, are the important next steps for Asunción. In addition to the Cancer Law, the City Executive Committee continues to work on a range of initiatives to ensure improved cancer control in Asunción. Other gaps identified by the needs assessment for Ascunión include a lack of trained medical professionals, the need for external quality assurance programmes for diagnostic and treatment services, the absence of standard protocols and multidisciplinary teams driving treatment decisions, an outdated essential oncology medicines list, and a lack of access to these medicines, limited capacity of radiotherapy services and low availability and use of opioids for cancer pain management. Priorities requiring high and low resource investment, that can address the above-mentioned gaps in cancer care, have been defined, agreed upon and set in motion by the City Executive Committee.